The long time frame for evaluating selection candidates is a major barrier to the deployment of genetic gain from tree breeding programs. This situation is compounded in wood quality studies by constraints on the number of sampled individuals when trees are older and larger. 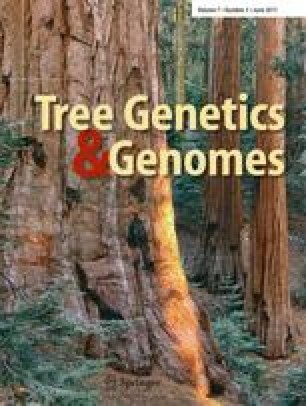 This paper documents the degree of genetic control and genetic association for wood quality traits in 18-month-old leaning Pinus radiata seedlings. Trees were separately assessed for basic density, green and dry acoustic velocity, and longitudinal and volumetric shrinkage in opposite and compression wood. Heritability estimates were low to moderate for both compression and opposite wood (ranging from 0.15 to 0.38). Estimated genetic correlations were very high in opposite wood, where green velocity displayed the highest correlations with both longitudinal (−0.89) and volumetric (−0.64) shrinkage, closely followed by dry velocity. These correlations were substantially lower for compression wood. The estimated correlations between compression and opposite wood characteristics were high for most traits except for longitudinal shrinkage. We suggest how these results could be used for very early screening for wood stiffness and dimensional stability. We propose that information on early genetic control of wood quality and the methodologies used to elicit it should be integrated in breeding and deployment programs. This project was funded by the New Zealand FRST Compromised Wood (P2080) Programme with participation of Forests New South Wales, Forest and Wood Products Australia, New Zealand Radiata Pine Breeding Company and Weyerhaeuser (USA). Genetic material and land for the trial was provided by Proseed Ltd. Many thanks to Dr Rowland Burdon and two anonymous reviewers for comments that contributed to greatly improving this article.